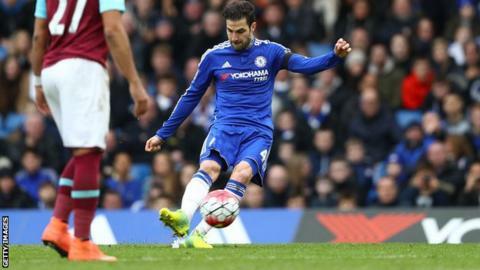 Cesc Fabregas scored a free-kick and a late penalty as Chelsea earned a point to frustrate West Ham's Champions League ambitions. The Hammers took the lead when Manuel Lanzini beat Thibaut Courtois with a sumptuous curling effort from 25 yards. Fabregas's superb set piece on the stroke of half-time pegged them back. Substitute Andy Carroll looked to have won it for West Ham, before Fabregas snatched a point after Michail Antonio fouled Ruben Loftus-Cheek. Victory would have moved West Ham in front of Manchester City into fourth place, but Slaven Bilic's side were unable to add Chelsea to Manchester City, Liverpool and Arsenal on their list of away scalps this season. Chelsea, who remain unbeaten in the league under interim boss Guus Hiddink, stay 10th. After Carroll finished clinically from Dimitri Payet's superb through-ball, West Ham were two minutes plus added time away from their first victory in Stamford Bridge at 14 years when substitute Loftus-Cheek tumbled in the area. Referee Robert Madley pointed to the spot, but replays appeared to show that rather than being clipped by Antonio, the midfielder tripped over his own feet. In addition, Antonio - who had scored in each of his previous three league matches - appeared to be outside the box when Loftus-Cheek went down. "To concede that late is gutting, but to concede it from a penalty that is not a penalty is unacceptable," Bilic said. "It was not close to the line. It was way out. It was not a penalty. We are gutted and we are not getting these decisions." Following last week's defeat by Everton in the FA Cup, reigning league champions Chelsea have nothing left to play for this season - but they showed plenty of battling spirit to take a point from this match. The Blues were not at their fluent best but 18 crosses and 22 shots told the tale of their unstinting endeavour in forward areas. Fabregas, a superb performer last season, has endured a much more difficult campaign this time round, and has sometimes been accused of going missing in difficult matches, but here he was at his influential best. His free-kick was masterful, getting the ball up and down from 25 yards and beating the dive of Adrian after Winston Reid had fouled Oscar. But his performance was about much more than goals - the 28-year-old Spaniard also had more shots, passes and touches than anyone else on the pitch. Chelsea manager Guus Hiddink: "We stared well in the first 10 minutes but we then started losing the possession too easily. We reacted just before half-time, especially with the beautiful Fabregas free-kick. In the second half we got caught on the counter, but we reacted perfectly to get the draw. "This is a very good West Ham side. They are knocking on the door for the top four. I was happy with the late penalty decision. It's difficult for me to make a judgement - I think he was tripped on the line. On the line is part of the box." West Ham manager Slaven Bilic: "I don't look too much at the table but what gives me confidence is the way we are playing, no matter who or where. "We are capable and we are having chances against any team. That approach should take us far." Cesc Fabregas scored twice in a Premier League game for the first time since December 2009 - a game which also featured his last goal direct from a free-kick. Fabregas is the fourth Chelsea player this season to score a direct free-kick goal in all competitions (Oscar, Willian, Hazard being the other three). Four of Manuel Lanzini's five Premier League goals this season have been scored away from home. Chelsea have now conceded in each of their last nine Premier League games at Stamford Bridge. Chelsea face Aston Villa on 2 April, while West Ham host Crystal Palace. Match ends, Chelsea 2, West Ham United 2. Second Half ends, Chelsea 2, West Ham United 2. John Obi Mikel (Chelsea) wins a free kick in the defensive half. Attempt missed. Ruben Loftus-Cheek (Chelsea) right footed shot from the centre of the box is close, but misses to the left. Assisted by Bertrand Traore following a set piece situation. Attempt saved. Dimitri Payet (West Ham United) right footed shot from outside the box is saved in the bottom right corner. Willian (Chelsea) is shown the yellow card. Hand ball by Cesc Fàbregas (Chelsea). Goal! Chelsea 2, West Ham United 2. Cesc Fàbregas (Chelsea) converts the penalty with a right footed shot to the bottom right corner. Michail Antonio (West Ham United) is shown the yellow card for a bad foul. Penalty Chelsea. Ruben Loftus-Cheek draws a foul in the penalty area. Penalty conceded by Michail Antonio (West Ham United) after a foul in the penalty area. Attempt blocked. Andy Carroll (West Ham United) header from very close range is blocked. Assisted by Dimitri Payet with a cross. Aaron Cresswell (West Ham United). Substitution, Chelsea. Ruben Loftus-Cheek replaces Oscar. Attempt missed. John Obi Mikel (Chelsea) right footed shot from outside the box misses to the right. Attempt missed. Gary Cahill (Chelsea) header from the centre of the box is close, but misses to the right. Assisted by Willian with a cross following a corner. Attempt blocked. Cesc Fàbregas (Chelsea) right footed shot from the right side of the box is blocked. Corner, West Ham United. Conceded by Willian. Attempt saved. Andy Carroll (West Ham United) header from the centre of the box is saved in the centre of the goal. Assisted by Dimitri Payet with a cross. Corner, West Ham United. Conceded by John Obi Mikel. Attempt blocked. Dimitri Payet (West Ham United) right footed shot from the centre of the box is blocked. Assisted by Andy Carroll. Attempt missed. John Terry (Chelsea) header from the centre of the box is just a bit too high. Assisted by Cesc Fàbregas with a cross following a corner. Substitution, West Ham United. Emmanuel Emenike replaces Enner Valencia. Attempt missed. Cesc Fàbregas (Chelsea) right footed shot from the centre of the box is just a bit too high. Attempt blocked. Oscar (Chelsea) right footed shot from the right side of the box is blocked. Assisted by Pedro with a cross.